Lowes is the second-largest home improvement retailer in North America, second only behind Home Depot. There were over 2390 Lowes locations in North America as of early 2018, however, at least 50 locations have closed in recent years. There are at least 115 Lowes stores located in Texas. 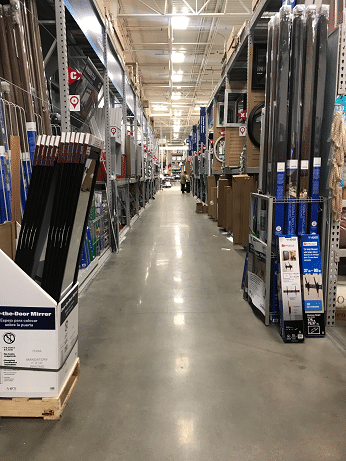 As you can imagine, an organization the size of Lowes has skilled risk management professionals they rely on to defend against injury claims made by customers who sustain injuries on their property. If you are injured at Lowes, you need to speak to a premise liability lawyer regarding your Lowes accident to learn your rights. Call Simmons and Fletcher, P.C. today for a free consultation regarding your Lowes accident at: 1-800-298-0111. In many states like Texas, businesses have a duty to provide a safe place to shop to their patrons. They are not, however, complete insurers of their safety. Unfortunately, with an operation as big as Lowes, accident prevention is very difficult. Thus, they are held to the standard of a reasonably prudent person when it comes to a premise liability claim against Lowes. that Lowes failed to either remedy the condition or warn the victim of the dangerous condition. These are the elements of a Premises liability claim. Because the injured victim has the burden of proof, he/she must prove each of the elements above. Proving that a store knew or should have known of a dangerous condition can be very difficult in many cases. Thus, it is critical that you send the proper notification letters to trigger a duty to preserve any video evidence that might establish the source of the dangerous condition and how long it existed before the client’s fall. Failure to promptly act to preserve this evidence may result in the legal destruction of this evidence. This is why you need an attorney’s advice on your Lowes injury claim immediately. If you have been seriously injured in a Lowes accident, call us for a free consultation today. Employees are not immune to injury while working for Lowes. They may be injured from a slip or trip and fall, from working with machinery and/or forklifts or from motor vehicle collisions. In 49 states, a Lowes employee can file for worker’s compensation to cover their on the job injuries. Texas, however, is the one State that does not require employers to provide workers compensation. Instead, Texas Lowes use alternative employer-provided injury benefit plans that do not provide the same coverage as workers compensation. The plans we have dealt with typically have a forced arbitration clause that deprives the employee of a day in court and sends him/her to a forced arbitration proceeding. While these plans place significant limits and hurdles upon making recovery outside the plan, you do have the right to bring a claim for certain damages such as pain and suffering that are not covered by the employee benefit plan. For a free consultation regarding your arbitration rights, contact us at: 1-800-298-0111 or for more information on your work injury claim at Lowes, visit our work injury page.